, professor of history in the university of Leyden, was born at Lisle, April 8, 1561. He began his studies at Aix la Chapelle, whether his parents, who were Protestants, had retired during the tyranny of the duke of Alva. He went afterwards to Leyden and Geneva, where he studied divinity: after residing here some time, he returned to Ghent, and again to Leyden, where he applied to the civil law, and was admitted elector of law, June 1585. Soon after, he accompanied the ambassadors from the states to England, and during his residence here became acquainted with several persons of distinction, particularly the famous sir Philip Sidney. He was admitted advocate at the Hague, the 5th of Jarmary 1587; but being soon tired of the bar, went to France, where he remained ten years, and was much esteemed, acquiring both friends and patrons. Achilles de Harlai, first president of the parliament of Paris, got him to be admitted advocate of the parliament of Paris in 1592. In 1602, he went to England with Christopher de Harlai, the presidents son, who was sent ambassador thither by Henry | the Great; and the same year, having been named professor of eloquence at Leyden, he settled in that university. He read lectures on history after the death of Morula, and was permitted also to do the same on the civil Jaw. In 1611, the states conferred upon him the office of historiographer in. conjunction with Meursius and in consequence thereof he wrote “The history of the Truce.” Baudius is an elegant prose-writer, as appears from his “Letters,” many of which were published after his death. He was also an excellent Latin poet: the first edition of his poems. was printed in 1587; they consist of verses of all the different measures: he published separately a book of iambics in 1591, dedicated to cardinal Bourbon. Some of his poems he dedicated to the king of England; others to the prince of Wales, in the edition of 1607, and went over to England to present them, where great respect was paid to him by several persons of rank and learning. 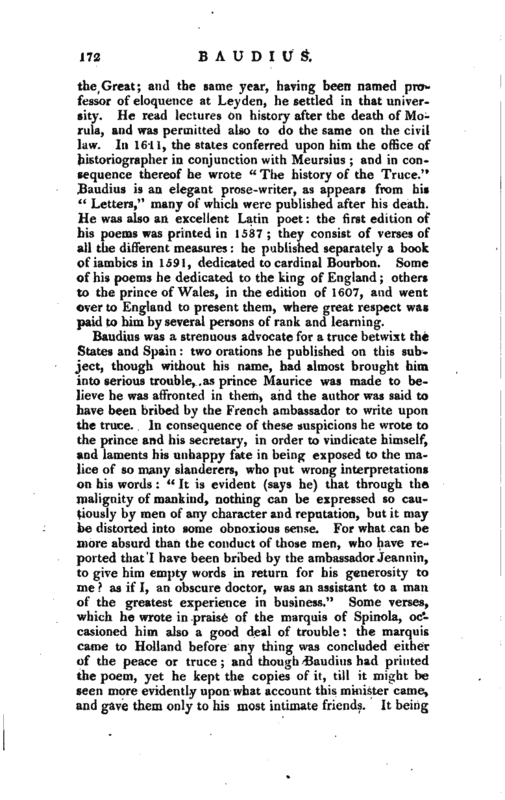 Baudius was a strenuous advocate for a truce betwixt the States and Spain: two orations he published on this subject, though without his name, had almost brought him into serious trouble, as prince Maurice was made to believe he was affronted in them, and the author was said to have been bribed by the French ambassador to write upon the truce. In consequence of these suspicions he wrote to the prince and his secretary, in order to vindicate himself, and laments his unhappy fate in being exposed to the malice of so many slanderers, who put wrong interpretations on his words: “It is evident (says he) that through the malignity of mankind, nothing can be expressed so cautiously by men of any character and reputation, but it may be distorted into some obnoxious sense. For what can be more absurd than the conduct of those men, who have reported that I have been bribed by the ambassador Jeannin, to give him empty words in return for his generosity to me? 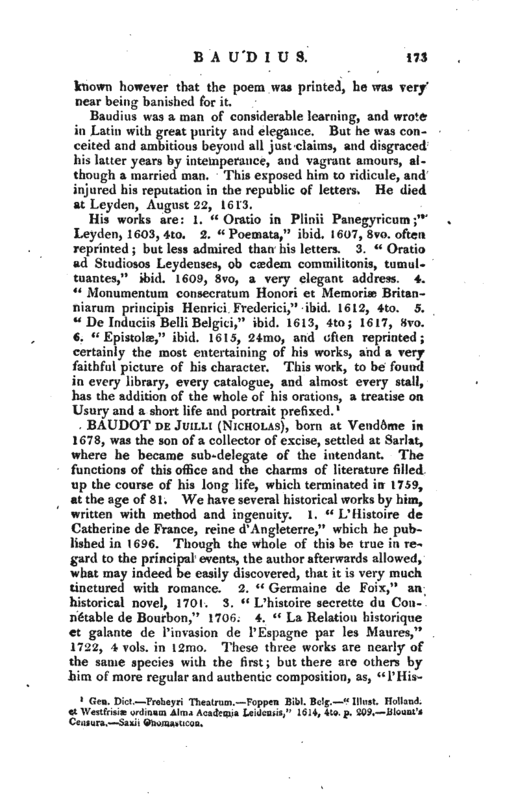 as if I, an obscure doctor, was an assistant to a man of the greatest experience in business.” Some verses, which he wrote in praise of the marquis of Spinola, occasioned him also a good deal of trouble: the marquis came to Holland before any thing was concluded either of the peace or truce; and though Baudius had printed the poem, yet he kept the copies of it, till it might be seen more evidently upon what account this minister came, and gave them only to his most intimate friends. It being | known however that the poem was printed, he was very near being banished for it. 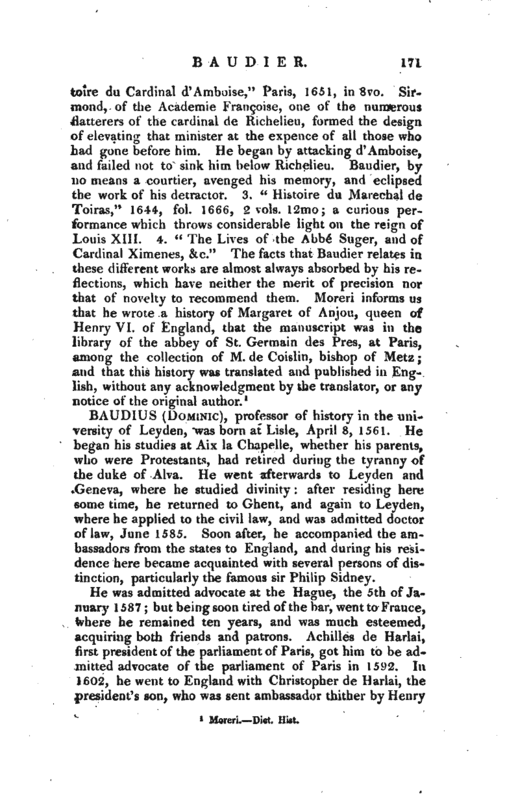 Baudius was a man of considerable learning, and wrote in Latin with great purity and elegance. But he was conceited and ambitious beyond all just claims, and disgraced his latter years by intemperance, and vagrant amours, although a married man. This exposed him to ridicule, and injured his reputation in the republic of letters. He died at Leyden, August 22, 1613. Gen. Dict.—Freheyri Theatrum.—Foppen Bibl. Belg.—“Illust. Holland, et Westfrisiæ ordinum Alma Academia. Leidensis,” 1614, 4to, p. 209.—Blount’s Censura.—Saxii Onomasticon.